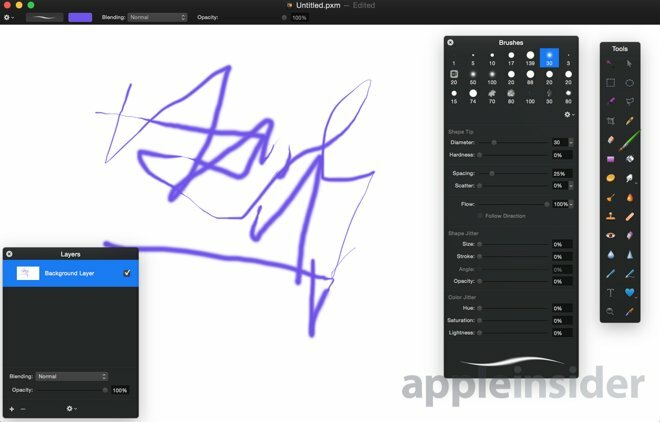 Popular photo editing tool Pixelmator was updated on Wednesday to add pressure-sensitive support for Apple's new Force Touch trackpad found on the latest MacBooks, as well as an advanced repair tool said to be five times better than its predecessor. Pixelmator 3.3.2 is now available to download from the Mac App Store. It's priced at $29.99 for new users, while the 3.3.2 update is a free download for existing customers. The update adds pressure sensitivity support using the Force Touch trackpad on Apple's latest 12-inch MacBook and 13-inch MacBook Pro. In a promotional video for the new update, which is free for new users of Pixelmator, the company said it spent more than two years working on the algorithm for its new advanced repair tool. Demonstrating its ability, the company showed how railings on a set of stairs, and then a person, were easily removed with the newly improved tool. The retouching tool features edge detection, content patching, and color matching improvements. The company says the smarter repair tool produces results that are five times better than its predecessor. You can now repair images non-destructively on a transparent layer placed in front with the "Sample All Layers" option selected. The app would previously stop responding on certain Macs when using the Repair tool with the document name popover visible. We fixed this. Performance used to get a little slow when working extensively with colors and styles of text and shape layers. Not anymore. The "New Layer from FaceTime" feature now works perfectly on all Macs. The Layers palette no longer dims after changing the image size. After using crop and undo actions one after the other, the thumbnails of grouped layers used to show inaccurate previews of the enclosed images. Now they're displayed beautifully. Sometimes, after dragging an image from a Web browser when the app was hidden or closed, the palettes failed to open. No more surprises. Now you can open 16-bit Photoshop images exported from Aperture. Previously, opening Photoshop images containing outer glow adjustments could cause the app to stop responding. That won't happen again. Small images used to jump to full zoom when zooming out with the pinch gesture. We fixed that, too. The scroll bar of the Gradients, Styles and Shapes palettes used to hide part of their thumbnails when the "Show Scroll Bars" feature was set to "Always" in System Preferences. Fixed. The app used to stop responding when grouping shape layers into many subgroups. Fixed. Sometimes, when connecting a MacBook Pro with discrete graphics and OS X Yosemite to an external display, weird graphical glitches would occur. We fixed that, too. Once in a while, the alert "The file doesn't exist" would pop up when trying to export a file in a different file format. It won't happen again (fingers crossed). Now you can Send Backward as many layers as you wish. The thumbnails of newly created gradients wouldn't show up properly in some localizations. Now, they are displayed just as they should be.